At the Harvard Chan School Forum on the nationwide opioid crisis, former governors Ted Strickland (from left) and Steven Beshear, the Menschel Senior Fellow, called for greater doctor cooperation and increased federal resources. Moderator and WGBH reporter Craig LeMoult led the discussion that was broadcast live on NPR. 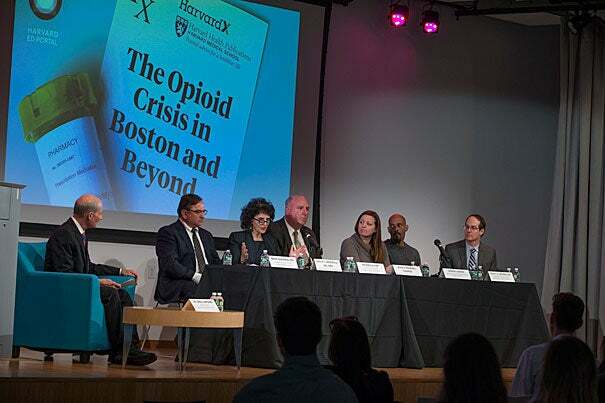 The Ed Portal and the Harvard Chan School each brought together experts last week to discuss how the nation’s opioid crisis developed and possible responses in health and policy. Reports on the panel discussions follow. If you think the opioid epidemic hits only a certain segment of the population, think again. In recent findings from the Harvard T.H. Chan School of Public Health nearly four in 10 Massachusetts residents report knowing someone who has misused prescription painkillers in the past five years. On Wednesday Curfman led a Harvard Ed Portal discussion on the impact of the opioid epidemic in Massachusetts. In 2015, the estimated rate of unintentional opioid-related overdose deaths was 25.8 deaths per 100,000 residents, representing a 26 percent increase, according to the Massachusetts Department of Public Health. In addition, the Centers for Disease Control and Prevention reported a significant increase in drug overdose-related deaths in New England, citing both prescription and illicit opioids as the primary cause. Opioid overdose deaths in Massachusetts increased 150 percent between 2012 and 2015, Curfman said. The Ed Portal discussion, in conjunction with the HarvardX and Harvard Health Publications free online course “OpioidX: The Opioid Crisis in America,” brought together Mark Albanese, an addiction psychiatrist at the Cambridge Health Alliance and assistant clinical professor of psychiatry at Harvard Medical School (HMS); Shelly Greenfield, chief academic officer at McLean Hospital and a professor of psychiatry at HMS; Detective Lt. Patrick Glynn of the Quincy Police Department; Efrain Lozada, a recovery coach at Massachusetts General Hospital; Jessica Moreno, a clinical pharmacist at Massachusetts General Hospital; and Scott Weiner, an emergency room physician at Brigham and Women’s Hospital. Opioids have been used for millennia to treat pain, and include prescribed drugs such as oxycodone, hydrocodone, codeine, morphine, and fentanyl, and also the illegal drug heroin. An explosion in prescriptions over the past 15 years created an opening for a dramatic rise in dependency, said Greenfield, whose interest is in gender-specific differences in opioid use and behavioral approaches to treatment. “Many people who have a substance-use disorder often have a co-occurring mental health condition either pre-dating, or a consequence of, their substance-use disorder or both,” she said. Those conditions may include depression, anxiety, post-traumatic stress disorder, even an eating disorder. Albanese stressed that treatment of opioid addiction is not one-size-fits-all, due to both internal and external barriers. In today’s emergency room, Weiner said, the patient with the highest mortality isn’t the one with chest or abdominal pain, but the patient with the opioid overdose. Because overdose risk is high for anyone using opioid medication, Moreno and Weiner said that recently implemented monitoring programs — allowing access to a database providing information to doctors and pharmacists about all controlled substance prescriptions used by a patient — are an effective way to reduce doctor and pharmacy-shopping, another component of substance-use disorder. Changing minds has been crucial for Glynn, whose initiative in the Quincy Police Department to turn addiction from a criminal to a public health problem has been replicated across the country. Glynn also devised a training program in 2010 for police officers to carry and administer Narcan, a medication used to reverse overdose in an emergency situation. Christine Ranchi ’07 has been personally affected by the opioid crisis. A former WGBH media producer, she attended the lecture to learn more about the intersection of prevention, treatment, and media. Lisa Jensen traveled from Wallingford, Conn., to attend the lecture. She is using the OpioidX course and working on her certification to become a recovery coach and feels strongly about raising awareness on addiction and overdose. A group of former governors said increased cooperation with doctors and increased resources from the federal government are key if progress is to be made in the fight against the nation’s opioid epidemic. The four governors, from Ohio, Missouri, Kentucky, and Hawaii, agreed that progress in the fight against addiction to prescription painkillers and illegal opioids like heroin will be difficult, and that an approach relying strictly on law enforcement won’t work. Instead, they said, cooperation with physicians can help ensure opioids are not overprescribed, cooperation between police and mental health professionals can help put treatment in place of prison, and additional resources from the federal government can boost crucial programs. The governors appeared at The Forum at Harvard T.H. Chan School of Public Health in a webcast panel presented jointly with WGBH News and PRI’s “The World.” The discussion was moderated by WGBH reporter Craig LeMoult. Steven Beshear, governor of Kentucky from 2007 until 2015, said that his state’s experience shows the difficulty of the crisis. Kentucky made progress fighting the painkiller abuse that many believe is at the root of the epidemic, only to see more people shift to illegal opioids like heroin and fentanyl. One program that worked well, Beshear said, was mandatory prescription drug monitoring, which requires physicians to check a patient’s prescription history before writing a new one. The program was effective in cutting down the practice of “doctor shopping,” in which a user gets drugs from several different physicians, Beshear said. After the program went into effect, opioid prescriptions dropped 25 percent, Beshear said. Physicians initially opposed it, but now see the benefits, he added. “Everybody eventually got on board,” said Beshear, who is Menschel Senior Fellow at the Harvard Chan School. Despite the progress, Beshear noted that the number of overdose deaths keeps rising. He called for a federal “Manhattan Project” to fight the problem. For former Ohio Gov. Ted Strickland, who left office in 2011, the fight is a personal one. Strickland told the story of two of his addicted nephews. One put his life back together through treatment. The other, who started on opioids after a back injury, died in an overdose. Strickland said the story shows that recovery is possible. Still, he said, the number of beds trails the number of people in need. Linda Lingle, who served as Hawaii’s governor from 2002 until 2010, said that her state restricted prescriptions to a seven-day supply, except in cases of cancer or end of life. Questions need to be answered, she said, about why the U.S. has such high rates of prescription opioid use — twice that of neighboring Canada. Another issue is why Medicaid patients have a higher rate of opioid prescriptions than the general population. Strickland noted another a big issue — the lack of non-addictive pain treatment. “We should be able to meet the health needs of people without endangering their lives,” he said. Panelists agreed that breaking down silos is essential to addressing the problem. Jay Nixon, who served as Missouri’s governor from 2009 to 2017, described a program in which the state placed law enforcement liaisons in 30 community mental health centers. The liaisons were available when police encountered people with likely mental health needs, including drug abuse. The program, Nixon said, got 18,000 calls in the first year and 34,000 after 18 months. Nixon said the program has been effective at diverting people with mental health issues into treatment. It has also highlighted for police the potential impact of mental illness in the community. Nixon told the story of one man who was arrested 56 times as he bounced between the emergency room and jail and who now, post-treatment, has a job. From the standpoint of the police, Nixon said, the program makes a lot of sense and spares them unnecessary calls. Director of the Center for Geographic Analysis Jason Ur has pioneered the use of drone aircraft to aid his research efforts for years, most recently using them to quickly create 3-D maps of ancient sites in Iraq’s Kurdistan region, such as this aerial survey of Girdi Dowlabakra.